Geprags Park is a well-known birding spot in Hinesburg. People are drawn to the park for the variety of species that can be found there, including rarities such as Golden Winged Warblers. What is less noticed by many birders is the slow and steady progress of invasive plant species altering this important habitat. On June 11, 2011 the Hinesburg Conservation Commission and Hinesburg Land Trust hosted a workshop at Geprags Park to highlight the importance of managing the habitat for birds and the negative impact of invasive species on critical habitat. Sharon Plumb Invasive Species Coordinator for the Vermont Nature Conservancy and Mark LaBarr from Audubon Vermont lead 27 participants into the field on a rainy Saturday morning. 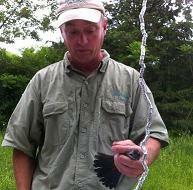 Mark set up mist nets and banded several birds that he caught. He explained the importance of the early successional shrubland habitat for many of the priority species that nest at Geprags. In addition to Golden-winged Warblers and Blue-winged Warblers, these include Eastern Towhees and Brown Thrashers. Mark works to protect these species and the shrubland habitat that supports them as part of Audubon’s Champlain Valley Bird Initiative. Audubon is partnering with the Hinesburg Conservation Commission, Hinesburg Land Trust, and the Vermont Nature Conservancy to maintain the shrubland habitat at Geprags by managing against invasives and for native shrub species. Mark’s banding demonstration was followed by a presentation by Sharon Plumb that highlighted the problems that invasive plant species pose for bird habitat. Many birders are unaware of the habitat loss that birds face due to invasive plants. Invasive plants also decrease the available food supply for birds. The buckthorn at Geprags, the predominant invasive species in the park, is an example of what can happen to bird habitat if invasive plants are not controlled. Invasive plants outcompete native plants and in the worst case, can become a monoculture. Many invasive plants bloom earlier and retain their leaves longer than native plants. Some are favored in landscaping because deer do not browse them. These plants then spread out from landscaped yards. Conversely, native plants tend to be overbrowsed, thus giving the invasives a larger foothold. For birds this altered habitat has several consequences. Many of our native plants evolved as hosts to native insect species. When invasive plants overrun an ecosystem, they disrupt an entire food chain. Native insects are less common in a habitat that is overrun by invasive plant species, having evolved with the native plants for food, egg laying and shelter. Likewise, birds may eat the seeds and berries from invasive plants, but these plants have less nutrition than the native fruits and seeds. Unfortunately, birds also carry seeds of invasive plants to new locations. At Geprags Park, the invasive species were mapped this past summer with the help of the Vermont Nature Conservancy and volunteers. A management plan will be written. From there, on-the-ground control of invasive plants and habitat restoration will begin. When an infestation of an invasive plant reaches the level of the buckthorn at Geprags, complete eradication of a species is very difficult. Eliminating manyof the plants and staying on top of the infestation is often the best course of action. Birder’s can help stop the spread of invasive plants by looking at the landscaping on their property as well as identifying invasive plants in their fields and forests. A small infestation is much easier to eradicate than waiting until the plant is out of control. An excellent resource is the gallery of invaders illustrated at http://www.vtinvasives.org/, which helps to identify invasive plants and explains the best ways to eliminate them. This website also offers native alternatives for landscaping. The invasive plant issue at Geprags Park illustrates the importance of not just conserving land for birds, but also keeping native ecosystems intact for nesting and feeding. Photos of Mark LaBarr banding birds and Sharon Plumb with the workshop participants courtesy of Melissa Levy. Thanks to Mark LaBarr for input on this article.